Locating investments in the right type of account can make a big difference in your retirement savings and lifestyle. Here's the story, told through an example of a hypothetical couple — Jodi and Mark — with a $1 million in savings. Their tax-advantaged IRA accounts hold $360,000 in stocks and stock mutual funds, plus another $240,000 in taxable bonds. Jodi and Mark's taxable account holds $400,000, with a 60% in stocks returning 10% annually in capital gains and 40% in muni bonds yielding 3.6% of income. After five years, the after-tax value of the taxable account is $548,000 and the IRA's after-tax value grows to $541,000 — a total of $1,089,000. But now look at what happens when you apply a little strategic tax planning by employing a strategy to optimize the location of your investments to minimize taxes. Optimizing for location would place all $400,000 in the taxable account in stocks to benefit as much as possible from the 20% favorable capital gains rate. 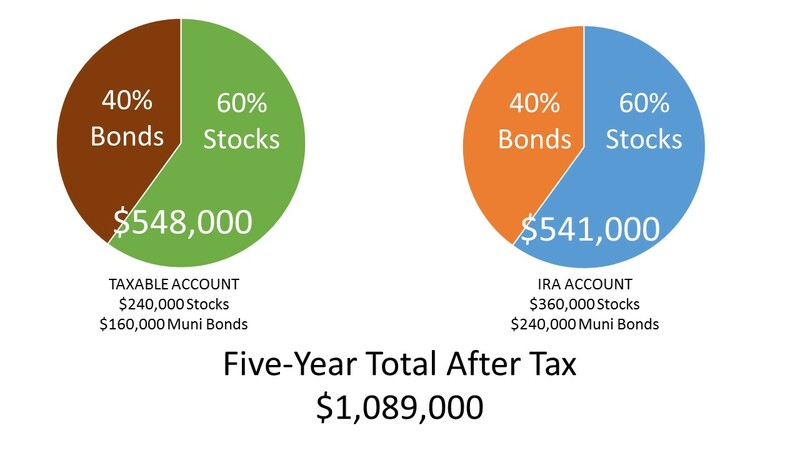 Why settle for income from the muni bonds of 3.6%, when the after tax-return on stocks annually over the long run has averaged 8%. Meanwhile, optimizing the $600,000 IRAs would mean holding $400,000 in bonds and $200,000 in stocks. 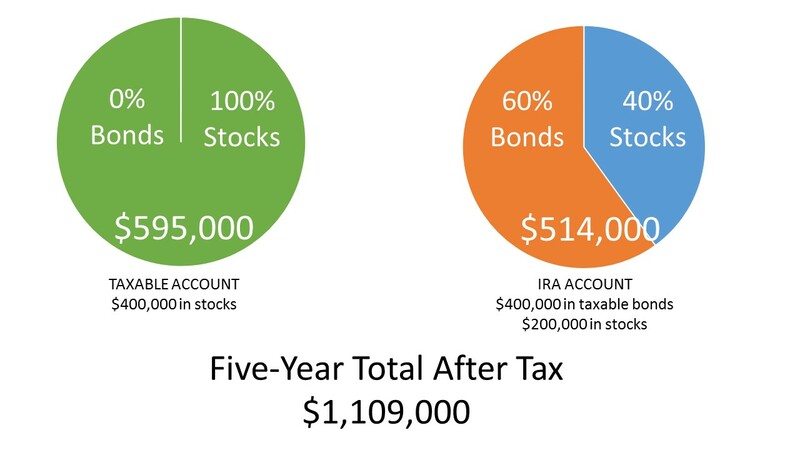 Instead of a 60% stock and 40% bond allocation, the IRA would hold the reverse — 40% in stocks and 60% in bonds. The bottom-line: $1,109,000 expected value on the total portfolio after five years versus $1,089,000. Getting an extra 2% — $20,000 — over five years on a $1 million portfolio may seem insignificant, but it compounds without being taxed every year in the IRA. After 10 or 20 years, the tax-advantaged compounding becomes so powerful it prompted Albert Einstein to say "Compound interest is the eighth wonder of the world." Because of the long-term nature of this strategy, getting started on the right course soon is wise. If you have questions about tax optimization, please contact us.